Re: [Mod] Vonkie's mod [01/12/12 - 012] Your own mods! seiseki wrote: can't you load another png as alpha channel? But I have little understanding of how to do that, yet. Still doing research. [quote="Yuri Melo"]For now, still is not opening on mac..
Ah, that's too bad, anything it says/does that can explain why it's not working? I tried the tapping coins into other coins, and it did nothing. I was the one to suggest it on the thread, so of course that was my first thing to try. I'll try it differently later, when I'm back at my computer. Dinjoralo wrote: I tried the tapping coins into other coins, and it did nothing. I was the one to suggest it on the thread, so of course that was my first thing to try. I'll try it differently later, when I'm back at my computer. The reason for this is me forgetting a "!" in the code, I'm sorry, I'll release a quick fix update. Hmm, I'm afraid it's hard to say what I can do about it, perhaps someone with unity-on=mac experience can come in and help? Ooooh. That explains it. I do, in fact, have them both on right click, Less confusing. Thanks for clearing that up. Dinjoralo wrote: Ooooh. That explains it. I do, in fact, have them both on right click, Less confusing. Thanks for clearing that up. Quick question, me and a friend downloaded this mod and we wanted to play a game together but we can't find each others game. We'll create the game, name it and put it under "Official Server" and his game doesn't show up in the list for me. I've tried making a game also and he can't find mine either. Am I doing something wrong? Thanks. Version 13 is great, do not know why but it was much faster on my pc, and for me this is the best way to get the coins, the mod Vonkie's is getting better, congratulations! And to improve it further, to make a correction from the original game when it zooms and looks at the corners of the table, is gray, as if it were infinite. Firstly, thank you so much for the mod Vonkie, it really enhances the game. 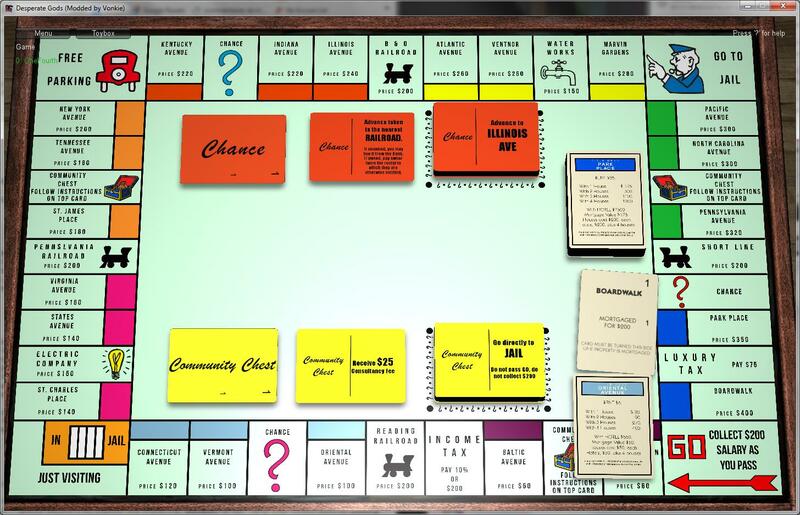 It features, the board, all property, chance and community chest cards. I haven't tested it yet (Waiting to go to some friends to try it), but I haven't seen any errors. I am not an artist, so I did steal the artwork, fonts and such. However besides the art, I made the board as you see it here, since I had to alter it to desperate gods' board size. The chance and community chest cards are only text because I couldn't find decent images of Mr. Moneybags. This was just a quick project to see how well I could fix up something. I want to make other board games, but there are limitations, of course. I would love to pick your brain about a few things. Particularly, what is the actual pixel ratio of the card faces? Desperate Gods has inspired me to start building a deck of cross-regional (Italian-French suits) playing cards that I wanted to implement into the game. I've built a few cards using a 1000x1400px ratio similar to regular playing cards, but I don't see the purpose in making much more until I know what DG's card size is. Congratulations again. You've started the ball rolling down a fantastic hill of awesomeness! Djemps wrote: That's an amazing Job!!! About the card size, if you mean the front/back of the card, the ratio is 1:1. that means you just have to resize those images' canvas to 1400x1400, with the rest being transparent(Which is possible in PNG). Use the Alpha channels of the TGA files of the source whenever you're not sure what should be transparent. I'm sorry for not explaining everything right. I'm a bit tired at the time of writing, I'll read everything again in tomorrow. OneFourth wrote: Firstly, thank you so much for the mod Vonkie, it really enhances the game. o.o Awesome work, this was kind of what I was hoping for to happen by allowing these mods, I wanna do more to allow you to make more use of the game's engine and such, but the bug currently visible are kinda killing my mood on it. I hope I can fix them somehow and just move on to more features, like those new dices and more. Vonkie wrote: About the card size, if you mean the front/back of the card, the ratio is 1:1. that means you just have to resize those images' canvas to 1400x1400, with the rest being transparent(Which is possible in PNG). Hmm, that doesn't exactly make sense. 1400x1400 would make a square, but clearly the cards are rectangular in size. I haven't located a card TGA to examine yet, so maybe it will make sense once I see it. Are the rectangular images occupying the center of a square frame with unused portions set to transparent?